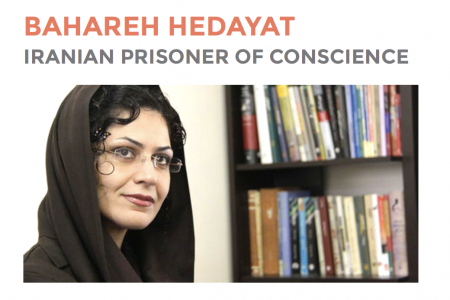 Bahareh Hedayat is the spokesperson and the only female member of the central committee in charge of public affairs of the Office for Strengthening Unity, the largest university students’ union in Iran. The union is one of the country’s strongest voices for political reform and human rights. She was also a founding member of the One Million Signatures Campaign, a grassroots movement demanding changes to discriminatory laws. The Campaign was the largest women’s rights initiative in postrevolutionary Iran. Bahareh, whose activities were crucial in building bridges between the student movement and the women’s rights movement in Iran, was arrested in December 2009, at age 28, in connection with protests following the disputed presidential elections. She has been in prison ever since.